I saw this lovely little poem recently by author Mary Stuber. Initially I smiled and laughed to myself, then I really thought about it and how true it is. 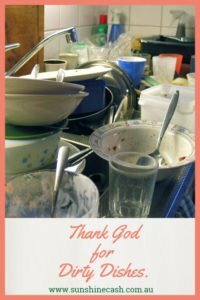 We are blessed that we can have food on our plates and a safe home in which to prepare and eat meals. Do you complain that the kids have left toys all over the living room floor? How blessed that, not only do you have children when so many cannot, but you have had the resources in your budget to be able to provide them with not only lots of toys, but a living room in which to play. Did you have a minor car accident and now have a repair bill? How blessed that it is only the car with a few scratches and dents and that you, your family or other people were not injured. Are you complaining about the cost of Christmas? How blessed are you that you have a large family and circle of friends that love you and deserve your generosity. I am attempting to make it my habit of stopping myself when I have complaint surface and reframe to find the good.